NYC: Times Square Tower | Flickr - Photo Sharing! 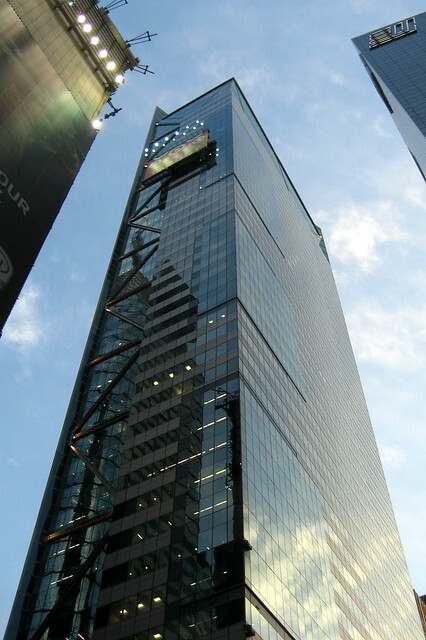 The Times Square Tower (7 Times Square), by David David Childs of Skidmore, Owings & Merrill, was the last of the four 42nd Street redevelopment towers to be completed in June 2004. At 47-stories (221.5m) it also ended up being the tallest. Arthur Andersen was originally supposed to be the anchor tenant, but backed out after the Enron Scandal. Like the neighboring 5 Times Square, the all-plot building was a tight fit, surrounded on three sides by subway lines, inlcuding station platofmrs and an entrance for the system's busiest station further complicating excavation and construction. As a concession, the foundations were made with minicaissons into the bedroom, and larger ones underneath the corners. Century-old foundation footings underneath the subway station were incorporated where possible. The Tower benefits from special zoning, resulting in uniform floor sizes and panoramic views from every floor. The diagonally braced perimeter frame supports lateral loads and allows wider spacing on the facade columns. Solid bands in the facade contain thin diagonal lines, and a series of slightly accentuated "zig zgs" from the base of the tower to its roof enhance the building's verticality. A four-story advertising sign is attached to its midsection. jjd2x, kewlio, erregi58, edenpictures, and 5 other people added this photo to their favorites. Hi, I'm an admin for a group called Manhattan Island, and we'd love to have this added to the group!